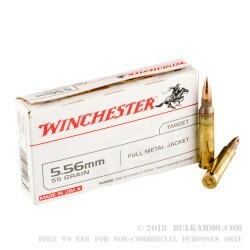 Regardless of your skill level, this 5.56x45 ammo by Winchester will work for you on the range and help you improve your long-range shooting skills. 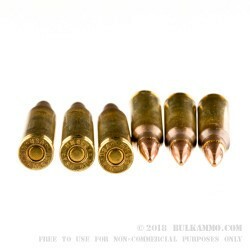 Manufactured to the tight tolerances required by military-grade M193 ammo, these cartridges have 55 grain full metal jacket (FMJ) bullets that resist expansion, shoot accurately, and exit the muzzle at 3270 fps. Winchester carefully selects powder loads best suited for these rounds that produce a restrained recoil; this is an added bonus if you are a new shooter who isn't used to the shoulder pounding that comes with long days at the range. 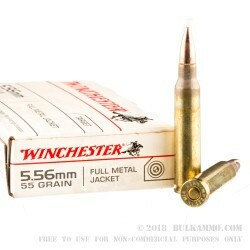 Winchester uses new-production brass casings for this 5.56x45mm ammo. Perfect for the avid hand-loader, these casings are Boxer-primed, non-corrosive, and reloadable. Winchester has been providing American shooters with some of the finest ammunition on the market for over 150 years. 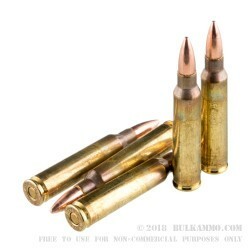 Whether you are target shooting, plinking, or range training, this 5.56x45 ammo will fit the bill. Order your 500-round bulk case today!